The Foxtail Pine (Pinus balfouriana) is a rare pine that is endemic to California,in the United States, where it is found in two areas with a separate subspecies in each, the typical subsp. balfouriana in the Klamath Mountains, and subsp. austrina in the southern Sierra Nevada. Foxtail Pines occur in the subalpine forest in these mountains: at an elevation of 1950-2750 m in the Klamath range, and 2300-3500 m in the Sierra Nevada. In the Sierra Nevada, Foxtail pines are limited to the area around Sequoia and Kings Canyon National Parks. In both areas, it is often a tree line species. Foxtail Pine is a tree to 10-20 m tall, exceptionally 35 m, and up to 2 m trunk diameter. The leaves are needle-like, in bundles of five with a semi-persistent basal sheath, and 2-4 cm long, deep glossy green on the outer face, and white on the inner faces; they persist for 10-15 years. The cones are 6-11 cm long, dark purple ripening red-brown, with soft, flexible scales each with a one millimetre central prickle. 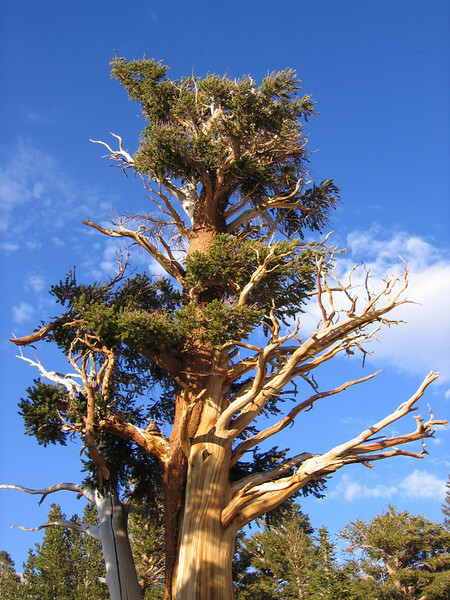 It is thought that Foxtail Pines can live up to 3000 years in the Sierra Nevada, although the highest currently proven age is 2110 years. In the Klamath Mountains, ages are only known to about 1000 years. The Foxtail Pine is closely related to the bristlecone pines, being classified in the same subsection Balfourianae; it has been hybridised with the Great Basin Bristlecone Pine in cultivation, though no hybrids have ever been found in the wild.